Sc. N/A Jackie Robinson Centennial — Not a first-day. Sc. 3186c Jackie Robinson (Celebrate the Century), 1381 Professional Baseball and 2016 Jackie Robinson on a 5"x7" Dragon Card showing a 1954 publicity photo of him batting against a photo of the JR display at Citifield (Mets' ballpark). 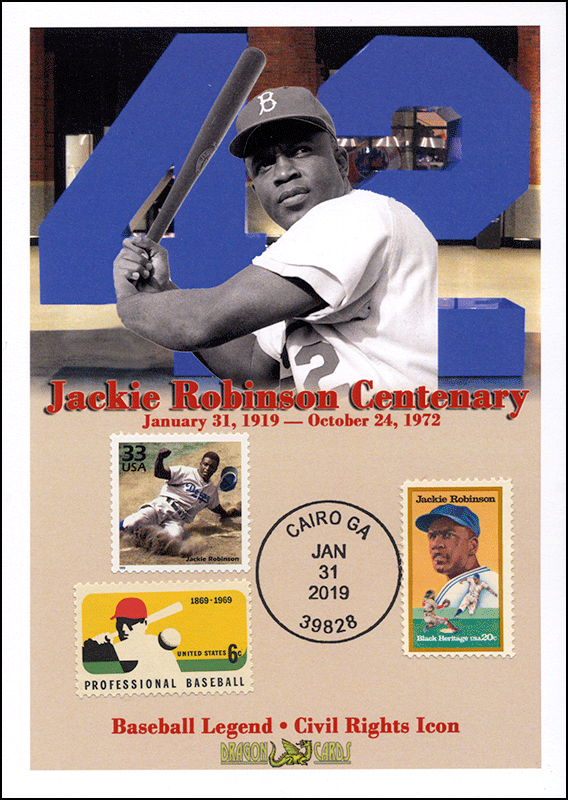 The special January 31, 2019, Cairo GA postmark notes the centennial of his birth. Note that on some cards the postmark may not touch some or all of the stamps. Great for a baseball-, Black History- or civil rights-on-stamps collection!